It’s June, and I’ve just come back from the United State’s largest book fair, Book Expo in New York City. 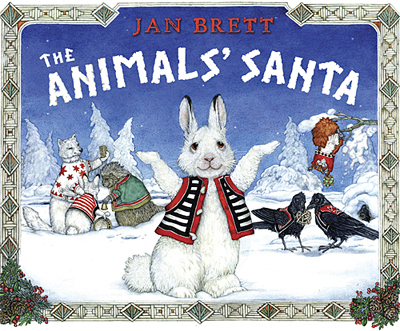 I saw my 2014 children’s picture book, The ANIMALS’ SANTA for the first time. I was very impressed with the printing of it. The pages seemed to glow and the images looked almost three dimensional. That’s because my publisher oversaw the printing and made sure the quality was top notch. I hope you agree when you see it next fall in bookstores. The advantage of working for an excellent publisher, is that the art department is the best. It is responsible for the art direction which includes the design of the book – especially of the jacket, the display type of the jacket, and the type. Not only does Marikka contribute her talent, but I feel her energy and love of design very strongly, especially after working for a year on the interior of the book and I’m tired. It’s fun to go into a bookstore or library and become aware of how much jacket design informs what is inside a book’s covers. One of my favorite jackets was for The Goldfinch, a novel by Donna Tartt. The jacket illustration imparts mystery and intrigue, the novel’s ties to the art world and the beleaguered innocence of its young boy protagonist. My jacket shows a young snowshoe rabbit, shrugging its shoulders as if curious but questioning. Marikka chose a display type that suggested old fashioned signage that makes the viewer feel that the story would journey back in time. Today my husband and I traveled to the Finger Lakes region of New York state for a poultry show. There is always an area where people sell their chickens. As we were perusing the area we saw a group of baby bunnies. Among them was a little boy bunny that looked exactly like Little Shoe, the main character of my new book. After much discussion we bought him, and he is ours. I hope we can provide a loving home for him. I have several pages finished of THE TURNIP, my retelling of a Russian folktale, and I can’t wait to dedicate my time to this challenge. I love painting the wonderful Russian old fashioned clothes on the badger family and on the mother bear character. When I went to Saint Petersburg three years ago. I brought back a suitcase full of books about clothing, architecture and crafts from the last century. I have the books propped up all over my art studio. It will be my most colorful book ever, although now that several pages have been done, I’m backing off on the bright colors of the borders as they compete with the main story a bit. Recently I visited the school my sister Sophie teaches at in Hollis, New Hampshire. I was once again taken by how much the children loved to draw, and how much they wanted to learn about it. Sometime the only thing between a person and a wonderful drawing is just making the time to do it. It’s a good ambition, and one I have as a goal for myself, making artwork! This entry was posted on June 8, 2014, 11:41 pm and is filed under Jan Brett Posts. You can follow any responses to this entry through RSS 2.0. You can leave a response, or trackback from your own site. Our family is SO excited about The Animal’s Santa!!! Can’t wait! I love your books I’ve read so much of your books.I love reading a lot. I love your books to i mostly like the gingerbread man keep writing.